In the not-so ancient past, Twitter users used to tweet out makeshift polls and use likes, retweets, or replies to get their “results.” It was a way of engaging with followers over timely events, random questions, and product promotions. Yet, without real-time voting options and results, these makeshift polls weren’t all that valuable. In fact, they were just like any other tweet meant to drive engagement. Thanks to the introduction of Twitter polls, all that's changed. We'll walk you through how to set up a poll below, and provide some inspiring examples to help you plan one of your own. 1) Click the 'Compose a Tweet' button in the top right-hand corner of your homepage. 2) Click the “Add Poll” option in the dialogue box that pops up and write copy for your polling question. Include relevant hashtags, @mentions, and links. Polls are just like any other tweet, just with the added polling feature. Keep it short, clear, and engaging. 3) Add at least two choices (up to four) on your poll. Dress your options up with emojis or witty options to show off some personality and catch the attention of folks scrolling by. 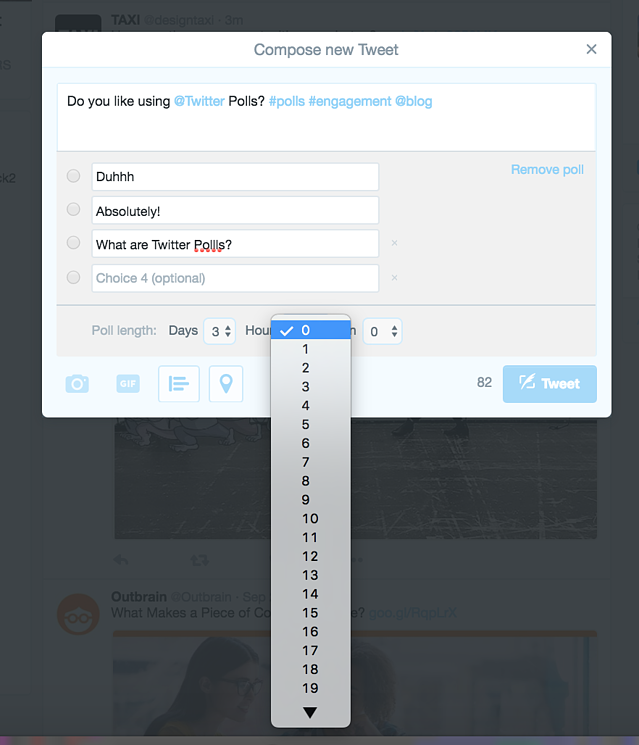 4) Set the length of your poll. 5) Click “Tweet” and watch your poll results come in during the set time period. Couldn’t be easier, right? So now that you know how to actually use Twitter polls, it’s time to dig into how you should use them to engage your audience, gain insights into your follower base, and provide context around your marketing campaigns and efforts. Luckily, we’ve curated examples from 13 brands to give you ideas for how to use Twitter polls to engage, delight, and entertain your followers. While Twitter polls aren’t really a reliable way to find sophisticated market data, they can be used to engage your audience by asking for follower insights. 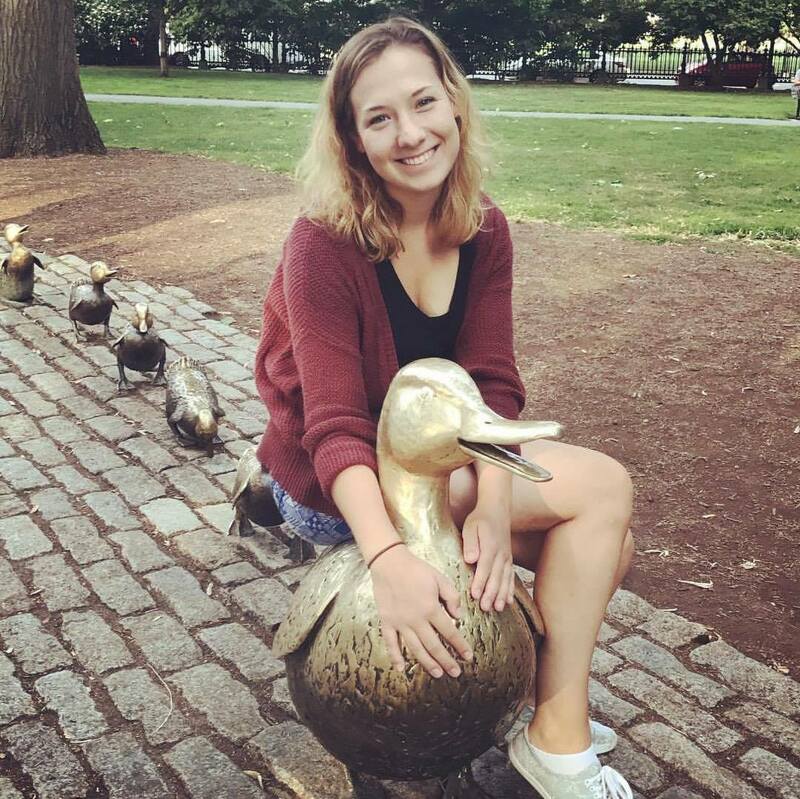 The Muse is a career advice and job searching site focused on providing job-related content to people looking for it. This particular poll serves as a stand out piece of social content that’s not only relevant to the audience, but also aims to generate engagement through votes, retweets, and likes. 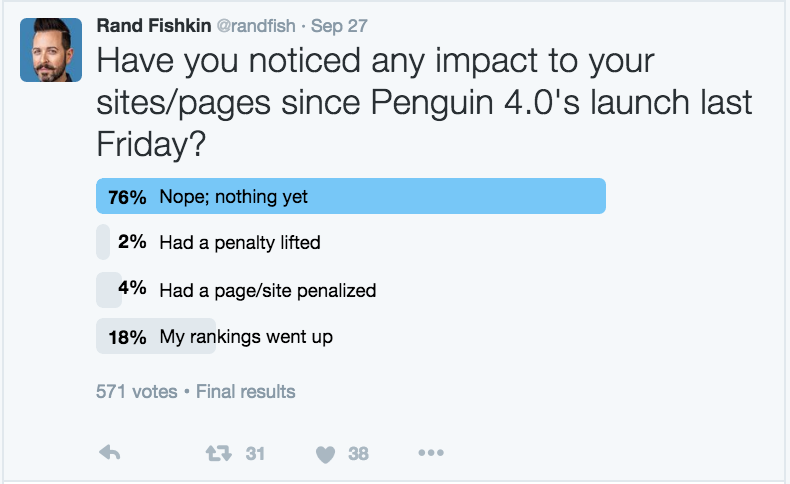 What's more, the results of the poll should offer interesting insights to inform future content. For example, if the #1 answer ends up being “fewer emails," The Muse could write a blog post around helping people clear out their inbox. Similarly, Eventbrite's poll also aims to collect follower insights related to holiday seasonal habits. Given that Eventbrite posted this poll in October, it’s probable that this poll was in part a strategic tweet aimed at getting its target audience thinking about holiday event planning. Yet, the results can also be used to help frame content or generate new holiday campaign ideas. Ideally, your Twitter followers fit your general buyer persona, which means you should have a strong grasp on the content they like to consume, as well as their interests. You probably already use this information to create your social media strategy, so why not tie polls into that strategy, too? While this kind of poll may seem silly and goalless (especially compared to some of your other tweets that may help you drive leads and blog views), it ultimately helps Product Hunt create a positive brand perception and generate audience engagement. These types of polls might just be for humorous purposes, but again we can see here how Urban Outfitters might be pairing their tweet messaging with seasonal, autumn promotions. But rather than just Tweet Fall content, they’ve created a Tweet that more effectively encourages engagements. When thinking up copy for your own Twitter polls, don’t forget to think about timing when it comes to surveying your followers. If you’re tweeting a poll to business professionals at midnight, you’re unlikely to get nearly as much engagement as you might if you were Tweeting the poll during commuting hours. This kind of mindset is helpful when it comes to planning when to schedule your Twitter poll. Want help choosing the best times to post on social media? Check out this infographic. This tweet is a great example of using timing to engage your audience, but it’s also an example of a way Evernote suddenly encourages users to use its product. 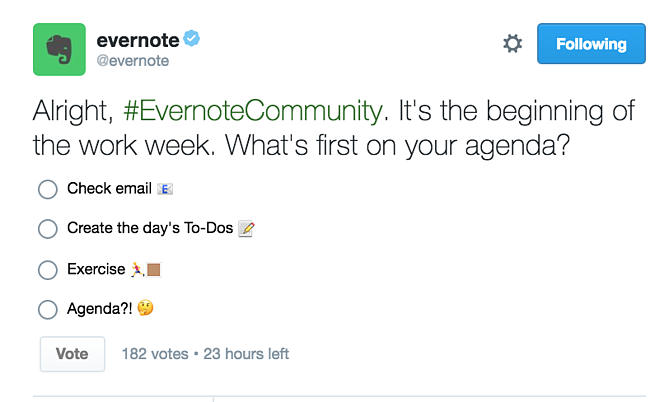 If a business professional is scrolling through Twitter and decides to create their to-do list for the week because they see this poll, they might decide to open up Evernote to do just that. It’s a great way to keep your products at the top of your followers’ minds. One of the best ways to take advantage of polls is by using timely events -- holidays, sports events, news stories, viral hashtags, and so on -- to engage your audience. Because Twitter users are already tweeting about these types of events organically, using polls to entertain them or add to the conversation is a strong strategy. Want to see it in action? Here are a few examples of brands that newsjack events by using polls. 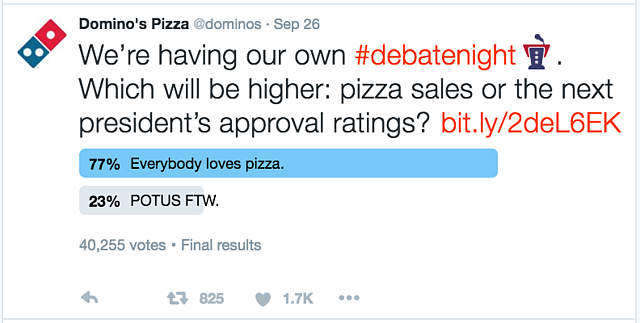 By using a timely event, Domino’s effectively tied the conversation around the debate back to the brand to entertain its followers (and hopefully encouraged a few of those voters to order pizza during the debate). This kind of poll is great because it’s relevant to the brand, sparks interesting conversation, and engages with the overall Breast Cancer Awareness Month conversation. Pretty clever, wouldn't you agree? Using timely events is one way to generate engagement, but you can also ask for relevant predictions through polls based on those timely events. Think about sports events or any other competition that might be relevant to your brand. Are your followers and target audience engaged and watching to see who wins something? Is it relevant for your brand? Use polls to ask for predictions and drive engagement before and after the event. Considering the National Football League was asking for predictions on a professional football game, it makes sense why this prediction is relevant to their brand. The lesson? Look for ways to poll for predictions that make sense for your brand, and always keep in mind the goal of engaging your audience based on what they’re interested in. Let People Choose Products, Features, etc. 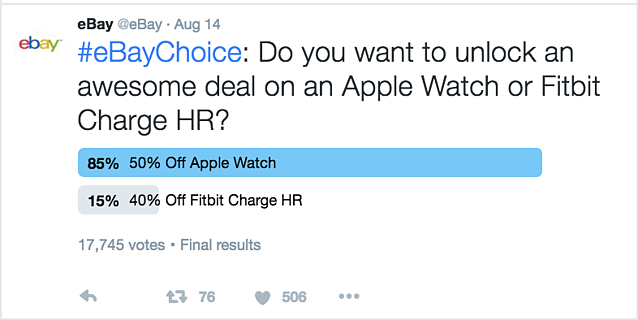 Twitter polls offer a great way to drive engagement and buzz around an upcoming product or offer launch by giving your followers a choice in the matter. 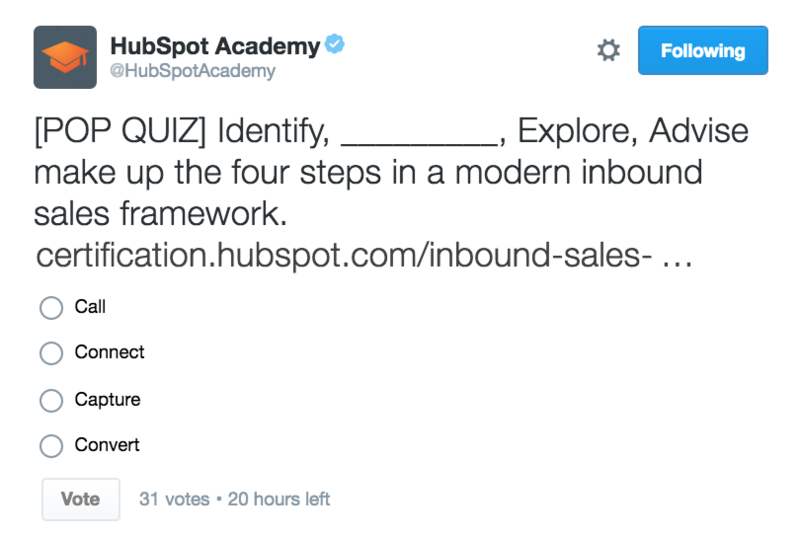 Keep this poll idea in mind the next time you launch a new product, event, deal, offer, etc. By letting your followers have a say in your launches, you’ll get them more excited and bring generate positive associations toward your brand. Promote Offers, Live Events, etc. 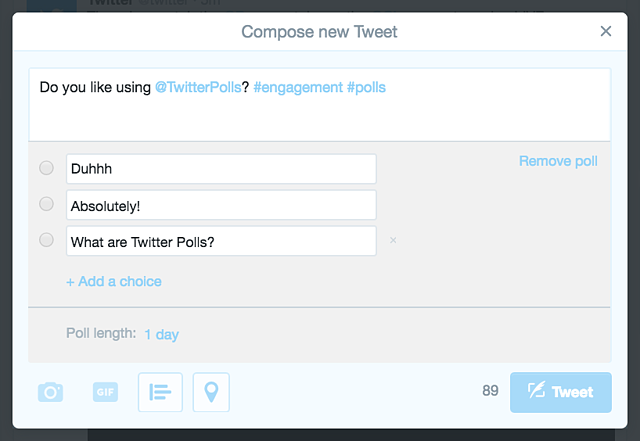 Here's another helpful idea: You can also use polls to set context for your marketing campaigns, content, and offers. Whether you’re promoting a blog post, an ebook, or some other offer, try asking engaging questions that set the user up to click the link and find the answer. Believe it or not, using polls to delight your audience with branded questions goes a long way when it comes to entertaining and engaging your audience. When trying to delight your audience, don't be afraid to have fun with it. As shown by COVERGIRL, not every tweet needs to be about generating leads or page visits -- in some cases, polls are simply a great way to encourage brand awareness. 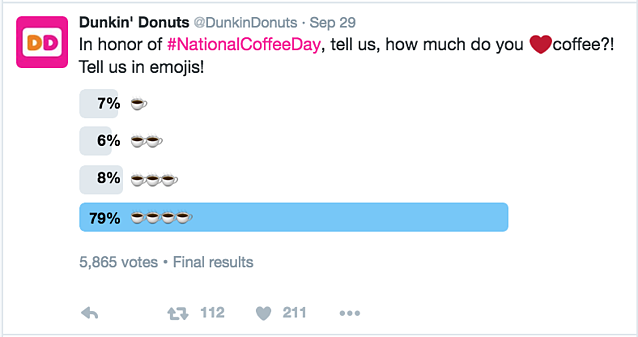 You now know how to use Twitter polls in practice, and you’ve seen some great examples of brands that are using polls to engage and delight their audiences. At this point, it’s time to take this information and create relevant, timely polls for your own audience. Don’t be too serious. 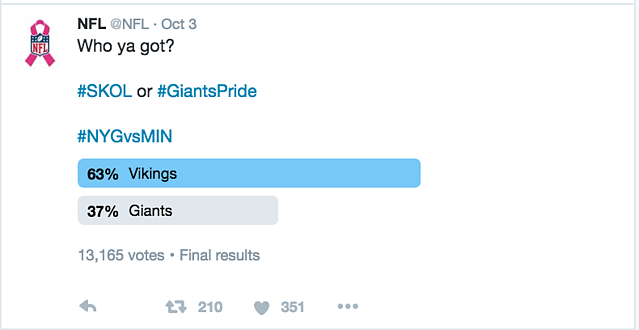 Twitter polls aren’t meant for mass market research. They’re meant to be fun pieces of engaging social content, so use them as such. Ask questions that your followers want to answer, not just questions you want to know. Use hashtags. Want to use polls as a part of your marketing efforts around an event or launch? Don’t forget to include hashtags and links in your tweet copy. Keep timing in mind. Just like any other social post, you should be posting your polls when followers are going to see it. Check out this blog post on the best time to post on social media -- but don’t forget to dig into the data on when your followers are using Twitter. Set context for your marketing campaigns. Polls are a great way to set context for your other content marketing efforts, events, or product/campaign launches. Ask your audience questions that set context for your campaigns and generate buzz for your content or launches. What's the best Twitter poll you've ever seen? Share your thoughts in the comments below.